Could money be freely available like wild flowers blossoming along the river? How can a community create their own independent medium of exchange? Despite its vibrant art scene and famous tourist attractions, Berlin is not among the most economically prosperous of German towns. (1) In a place with 3,5 million inhabitants, this means a lot of talent not being expressed and opportunities for meaningful economical exchange being missed due to lack of money circulating in the local economy. 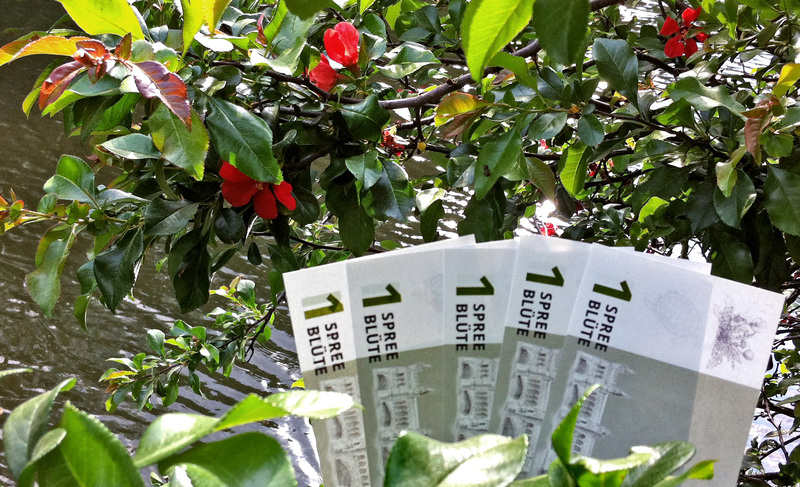 But what if money could sprout like the wild flowers that blossom along the Spree river meandering through the city, and be picked by everybody? Inspired by this image, a group of residents is working on making a complementary currency for Berlin a reality. 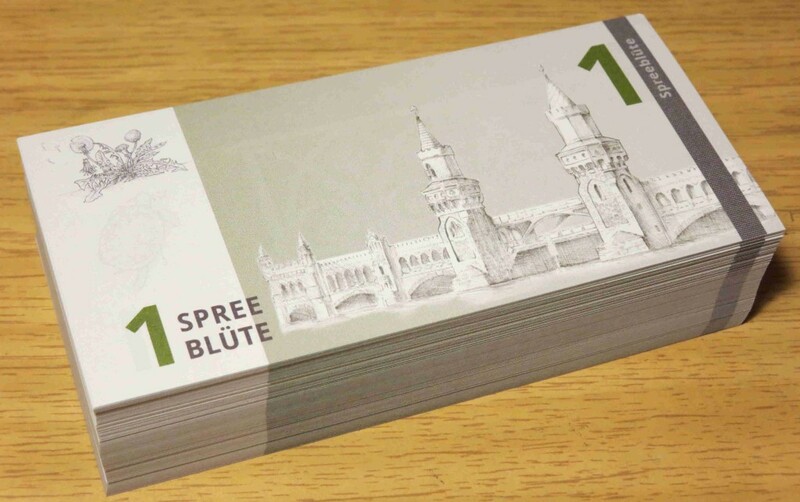 The local currency being developed is named Spreeblüte (Spree blossom) and the idea is to distribute it freely to individuals and businesses. The only requirement from those receiving this free money is to agree to accept it in exchange for goods and services they choose to offer. In this way, the currency will be backed by services provided by the community. The proposers of the Spreeblüte are working on a formula to calculate how much value in services each company and individual is able to offer, and that will determine how much of the Spreeblüte currency each of them will receive for free to jumpstart this complementary economic activity. They plan to have at least 100 businesses signed up for the project before launching it in circulation. Another interesting idea of the project is to reserve a space in the back of the notes to be used as advertisement by the participating companies. This creates a unique situation in which money is advertised into circulation. In a way this is similar to coupons issued by stores, but in this case they can be redeemed by anyone from the pool of participants, and not only at the specific store mentioned in each ad. It is also creates a valuable item for businesses, who will receive quite a lot of currency and would be otherwise limited to spending it either on suppliers who also participate in the project or as wages to employees, both potentially difficult situations that might otherwise prevent the businesses from being able to circulate all the notes they receive. How can local currencies promote sustainable development? One of the Spreeblüte aims is to bring more awareness to the concepts of regional economy and sustainable consumption. Instead of global growth it seeks to promote prudent local economies. Regional goods are often less transportation and resource intensive, besides providing local jobs for the residents. For the Spreeblüte creators, a key characteristic is that the currency is backed by services, and not by Euros. In this way the money can be issued interest-free, unlike funds coming from a traditional bank. It can then unlock additional wealth for the region by tapping into extra productivity available but not currently being exchanged in the Euro economy. A contemporary example of a local currency created as a mutual credit between small entrepreneurs is the Bangla-Pesa in Kenya. According to initial research (3), it generates 22% additional sales, made possible by excess capacity available but not being used before due to lack of currency. (1) Deutsche Welle (2012) ‘Poverty Study a Further Blow to “Poor” Berlin.’ 25.07.2002.